We note with sadness the passing of Louis Henkin (right), who died this morning at age 92. Lou, as some of us were honored to call him, may not have been much taller than I, but he was a true giant in our field -- in international law, particularly as it interrelates with the constitutional law of the United States. I first met Lou soon after I began teaching at the University of California, Davis, School of Law; I was privileged to serve as a moderator when our Journal of International Law & Policy held a symposium to mark the 2d edition of Foreign Affairs and the Constitution (1997), one of Lou's many landmark books. His kindness and erudition were evident, as was the high regard of the assembled conference participants. A year or two later, during an annual meeting of the American Society of International Law -- for which he served as President from 1994 to 1996 -- I was standing at a D.C. streetcorner, patiently waiting for the traffic signal to change. "You're obviously not from New York," came a voice from behind, and soon Lou, by then in his 80s, strode past me and safely crossed the empty road without regard for the red light. Lou, he was a New Yorker. Though born on Nov. 11, 1917, in what is now Belarus, he was resident in New York's Lower East Side by his 7th birthday, his family having fled anti-Jewish agitation in their homeland. Following undergraduate studies at New York's Yeshiva University and law studies at Harvard, he clerked first for 2d Circuit Judge Learned Hand, then for Supreme Court Justice Felix Frankfurter. He served in the Army during World War II, then worked at the U.S. Department of State, eventually arriving at Columbia Law School in 1956. There he undertook a truly stellar career in international law, marked by, among many other things, his service as Reporter of the Restatement (Third) of the Foreign Relations Law of the United States (1987). Many more career details may be found in this obituary at Columbia's website. On one of the too-few opportunities I had to talk with Lou, we discussed a then-forthcoming casebook for which he was the 1st-listed author. He noted with pride that he had succeeded in naming the book, simply, Human Rights. No "international" to modify -- perhaps, implicitly to undercut -- what he saw as the chosen words' fundamental, universal essence. 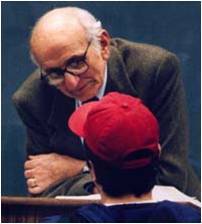 Professor Henkin was not only an important scholar, he was also a wonderful mentor to me and to countless other students at Columbia Law School. He was one of the main reasons that I attended Columbia and tremendously influential in my life and career. He will be missed immensely. He was a giant indeed. And Lou did not feel any need to trumpet his "giant-ness." In his interactions with those around him, he lived out the principle in Article 1 of the Universal Declaration of Human Rights that all human beings are born equal in dignity and rights. Diane, this is a beautiful tribute to a great man and teacher (in formal and, as I was lucky to meet him, informal settings). A bit of background on Lou Henkin’s teaching career: In spring 1955, he had a temporary teaching appointment at Harvard Law School. As that semester wound down, Professor Paul Freund wrote to Justice (and former HLS professor) Frankfurter, for whom Lou Henkin had clerked, that “we are completely of one mind about Lou Henkin and his rare gifts for teaching.” Unfortunately, Freund continued, “[a]fter some canvass here, I became satisfied that it was not possible to put an appointment through for the next academic year, owing to the fact that budget and teaching schedules were already made up and there was not a sufficient head of steam where needed to drive through a senior appointment in the international field at this stage. It seemed clear that if Lou were to go into teaching next year at another school, he would be helped rather than hindered in coming here later, at least as far as we are concerned. Consequently I took the opportunity afforded by the letter from Columbia[—apparently an inquiry about Henkin’s strength as a candidate to join the faculty there—]to contribute my bit without reserve. This is not a satisfactory solution but the question is one of timing.” Well, sort of: The next year, Henkin came to Columbia to direct a project on disarmament. After then teaching for the next five years at Penn, he joined the Columbia faculty in 1962. It all worked out quite well.